Hey folks! This is short notice but I’m teaching a Thai-inspired class this Saturday in Makati! Check it out if you’re interested. RATE: P1950 if prepaid by January 19 Thursday, P2250 after January 19. Applicable to both QC and Alabang locations. Hello folks! The new year brings new resolutions and one of the popular ones is to eat more healthfully. Let 2017 be the year you follow through! 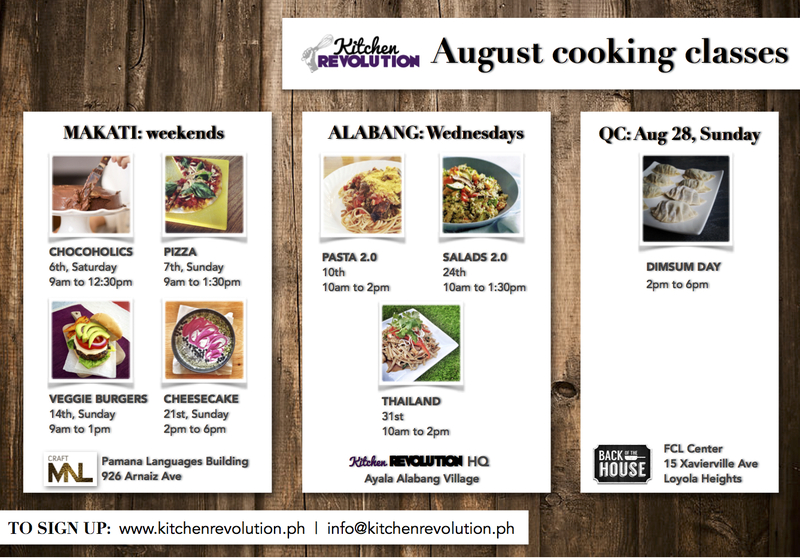 We’ve got 3 classes scheduled for Makati, 3 in Alabang, and 2 in QC. RATE: P1950 if prepaid by January 5 Thursday, P2250 after January 5. RATE: P1550 if prepaid by Thursday January 5 Thursday, P1850 after January 5 Thursday. RATE: P2050 if prepaid by January 5 Thursday, P2250 after January 5 Thursday. ATTENTION! We have an impromptu pizza cooking class happening this Saturday morning in Makati! Who doesn’t love pizza? A healthy diet isn’t drinking green juice and eating salad all day. Guilt-free pizza is definitely achievable in your own kitchen – why pay someone to make you a tolerable vegetable pizza when you can make one (or 9) yourself that you will actually want to devour? Come to PERFECTION ACHIEVED BY WAY OF PIZZA and I promise, you won’t find better pizzas around. RATE: P2450 if prepaid by Thursday December 1, P2750 after December 1. We’ve got 4 classes scheduled in November in Makati – all on weekends. Applicable to Alabang classes, too! Early bird rate of P1950 if paid by Wednesday, November 16, P2250 after November 16. RATE: P1950 if paid by Thursday November 17, P2250 after November 17. RATE: P2150 if paid by Thursday November 24, P2450 after November 24. RATE: P2450 if paid by Thursday November 24, P2750 after November 24. Sign up and pay for at least 3 classes by November 2, Wednesday and get 10% off! Sign up for a class with 2 other friends by November 2, Wednesday, and get 10% off! Hello hello! 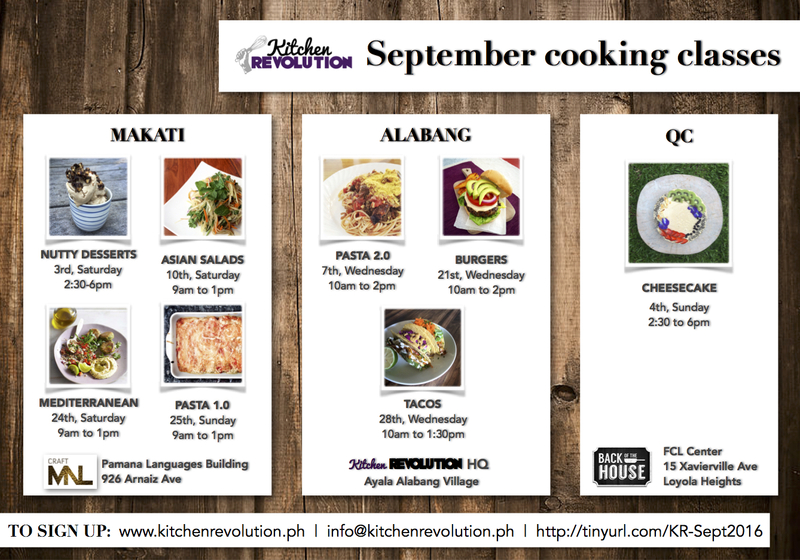 We’ve got 4 Makati classes scheduled this September – 3 Saturdays + 1 Sunday. We have 1 QC class and 3 Alabang classes, too!